Location: Close to the upper end of Penpaled Road, near the level crossing. The chapel was founded in 1889 by a group leaving Capel Mawr. This Welsh Calvinistic Methodist congregation worshipped in the English Methodist Chapel for a time, but built their own chapel in 1895. Smooth rendered main facade with rough-case rendered and terracotta dressings, and roughcast render to return elevations. Slate roof with red tiled cresting. Galleried plan expressed as 2 storeys externally; entrance in gable end facing the street, the only elevation to receive decorative treatment. 2 storeys, 6 bays (1-4-1), the outer bays slightly advanced with stressed angle quoins and balustraded parapets. Narrow round-arched window with moulded plaster heads at each level. A row of 3 advanced gables in the central range form the porch and entrance lobbies: wider central gable is carried over open porch on a cast iron column. Symmetrical outer gables to inner lobbies have roughcast angle quoins and paired round arched windows. The gables are pedimented by heavy mouldings, with moulded terracotta panels filling the apexes. Above them, a row of 4 round arched windows with margin light glazing, linked by a continuous impost band. Steep pedimented gable over central range, with terracotta panelling filling the apex. 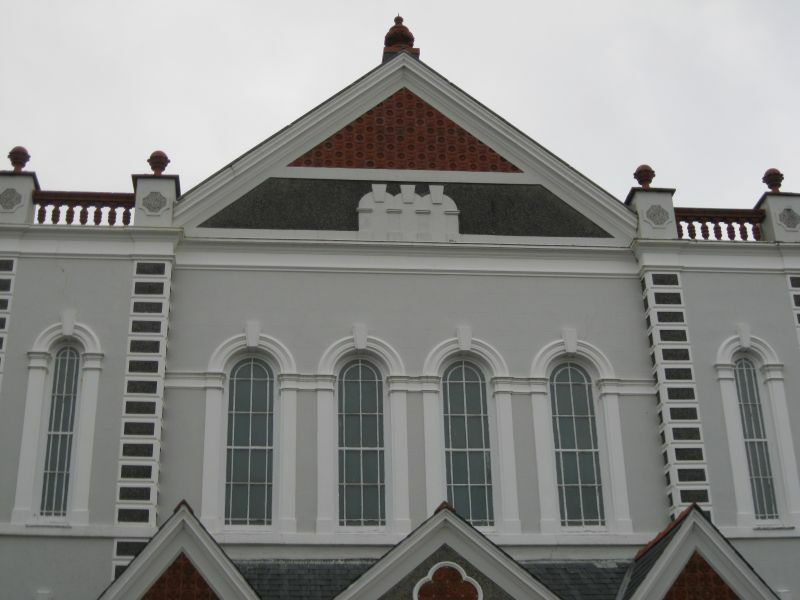 Terracotta balustrading to parapet which surmounts the outer bays. Simple round arched windows in return elevations to either side. Horseshoe gallery linked to organ loft to NE, carried on cast iron columns and making decorative use of wood graining and incised panels. Box pews, their lines curved around the pulpit towards the NE. Two aisles. Set fawr and pulpit also highly decorated, including fretted panels to set fawr, and low relief lilies in urns on pulpit. Coving to enriched plaster ceiling, the highly enriched central rosettes contained in a panel of fretted woodwork which is surrounded by simpler plaster panels and rosettes. The walls retain the original lined-out plaster finish. Listed for a striking and unusual design, flamboyant in its interpretation of Classicism and in its use of materials, and retaining a fine interior.